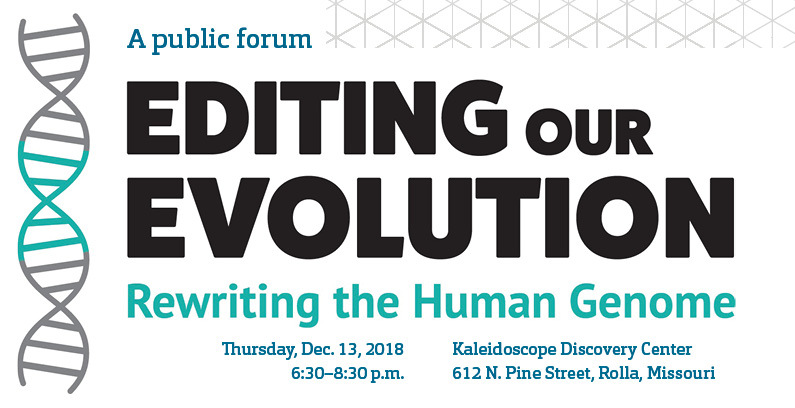 The biological sciences department will host a public forum, “Editing our Evolution: Rewriting the Human Genome,” 6:30-8:30 p.m. Thursday, Dec. 13, at Kaleidoscope Discovery Center. The center is located at 612 N. Pine St. in Rolla. Please register online at rol.la/genome2018 by Wednesday, Dec. 12. The meeting is free and open to the public. The forum comes on the heels of the timely topic of genetic alteration of human embryos, which scientists in China recently claimed to have done using CRISPR (clustered regularly interspaced short palindromic repeats) technology. The technology can edit genes within organisms, especially for the purpose of making humans resistant to certain viruses such as HIV, smallpox and cholera.